CARBONDALE, Ill. -- The MidAmerica Healthcare Executives Forum is honoring two Southern Illinois University Carbondale students for their academic excellence, volunteerism, leadership and involvement in health care activities. Dennis Ramsook, a senior business management major with specialization in management of health-care enterprises from Terre Haute, Indiana, and Jacqueline Nash, a sophomore health care management major from Bettendorf, Iowa, are the 2017 recipients of the MidAmerica Healthcare Executives Forum Award. Nash was selected as a recipient of the award by the School of Allied Health’s Health Care Management Program faculty and administration. The College of Business Department of Management faculty and administration selected Ramsook for the recognition. The awarding organization comprises more than 200 health care professionals who serve as leaders for hospitals, health care systems and other health-care related businesses and operations throughout central and Southern Illinois. Ramsook was born in Mandeville, Manchester, Jamaica, but spent his childhood in Rockaway, N.J., before moving to Indiana. He is a 2014 graduate of Terre Haute South Vigo High School, earning a Core 40 with Academic Honors diploma. 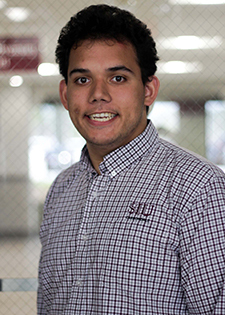 At SIU, he is also completing minors in accounting and marketing and has been a founding father and president of Lambda Chi Alpha fraternity. In addition, his campus involvement includes serving as executive director of the Residence Hall Association, a Saluki Ambassador for Undergraduate Admissions, vice president of external affairs for the United Nations Association registered student organization and as a recruiter and site leader for The Big Event: A Saluki Day of Service. Ramsook plans to graduate in 2018 and continue his education in graduate school, pursuing dual master’s degrees in health care administration and public health. Nash is a graduate of Pleasant Valley High School, where she was a four-year honor roll student, swim team captain, National Honor Society member and mentor for special needs students. At SIU, she is also completing a minor in rehabilitation services while working as a student manager for the SIU men’s and women’s swim and dive team. She is the recipient of the College of Applied Sciences and Arts Honors Award for 2015-2016 and has been on the Dean’s List all three semesters thus far. In addition, Nash earned recognition as a Top 5% Psychology Student award-winner during the fall 2015 semester. Passionate about helping others, Nash plans to seek a career putting her organizational and leadership skills to good use working in health care management in a hospital setting. She will enhance her practical experience this summer through an internship at UnityPoint Health-Trinity in Rock Island, Ill.
Officials from The MidAmerica Healthcare Executives Forum will present the awards to Nash and Ramsook before the end of the spring semester. The honor includes a certificate and a monetary award.